Brabham Automotive made history today when the BT62, set a new unofficial lap record around the iconic Mount Panorama circuit. It clocked a verified time of 1:58.670 seconds – beating the previous best of 1.59.29, which was set by an unrestricted GT car in testing last year. 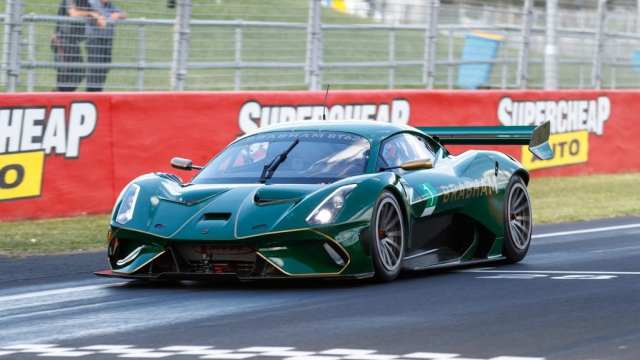 The Australian high-performance manufacturer was due to run BT62 demonstration laps for the crowds in the build-up to the marquee Liqui-Moly Bathurst 12 Hours event. Despite minimal previous testing and track time on Thursday where it set a 1.59.36, and only four laps of running on Saturday, conditions were good enough to go for a flyer which became the successful record-breaking run. The lap record is classified as an unofficial lap due to the fact that despite being recorded, it was not in a competitive session. With Bathurst specialist and BT62 test driver Luke Youlden behind the wheel, the BT62 shaved a remarkable 0.621 seconds off the official lap record. The achievement comes hot on heels of Brabham announcing its return to motorsport with a factory sports car programme aimed at returning to the WEC series and Le Mans.